I wasn’t expecting to feel fear. Excitement? Yes. Nerves? Yes. A bit of a thrill? Definitely. But when I held out my gloved hand for the first time and watched the hawk speeding toward me, eyes trained on my hand, my stomach lurched, and for just a moment I knew what it felt like to be prey. That flicker of fear, however, dissipated as Jason, my capable falconry instructor, corrected my form, and we walked further into the woods. Yes. You read that right. 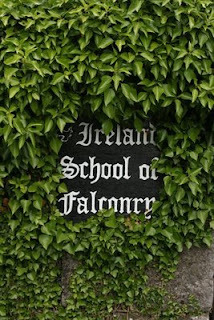 I spent last Sunday taking a falconry lesson at Ireland’s School of Falconry. 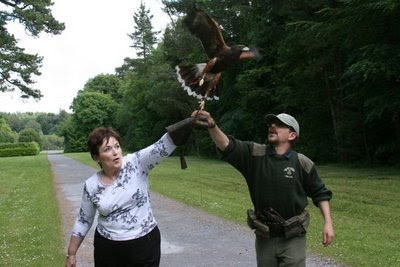 Located within the forested grounds of Ashford Castle in County Mayo, Ireland’s School of Falconry was the first institution of its kind in the country. 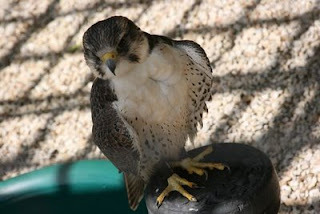 Here skilled falconers practice the art of hunting using raptors – hawks, owls, and falcons. 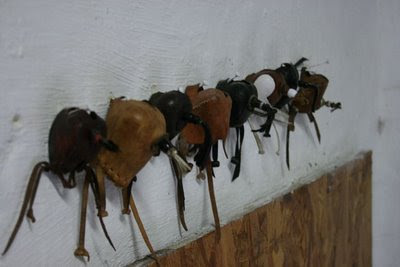 Human beings have employed these mighty hunters for more than 3000 years, and the practice is found in every corner of the globe. Price: the price varies depending on how many people are in the group and which program you choose, but for the two of us, the Hawk Walk cost €70 per person. Arrangements: guests of Ashford Castle can make arrangements through the hotel’s concierge, but the school is open to anyone in the area, and reservations can be made directly with the school. Reservations are necessary, but they generally can be made with little notice. Notes: be sure to bring your camera! No poking or touching the birds. Keep the gloved hand down or the bird will view it as an invitation to land on you. The birds are wild animals. They don’t always cooperate. Indeed, Jason explained that they’d had an interesting morning with hawks and owls disappearing during lessons – all things to be expected as the summer population of mice and other critters blossoms and becomes more tempting than the treats he keeps in his pouch. Once the talking was accomplished, Jason brought in our bird, Killary. Killary is a gorgeous Harris Hawk – nearly 4 years old and just beginning to sport his adult feathers. Standing just inches from him I was in awe. He perched on Jason’s arm, powerful but content as Jason changed his tethers, and we walked out of the school confines. A Hawk Walk is appropriately named. 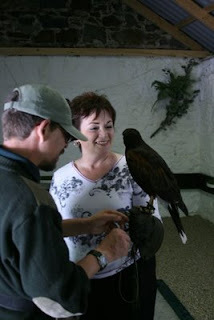 You and your instructor set off with a hawk for an amble through the castle’s grounds. Jason started off with Killary, but quickly he turned him over to my traveling companion who had the first turn at casting and receiving the hawk. She proved to be a natural. I was a little more unnerved, and it took me some time to relax into the stances. Each time I saw Killary’s eyes trained on my arm, my stomach did a little flip. I can only imagine what a mouse feels! As we walked the castle grounds, Jason, our instructor, dispensed hawk basics with humor and ease. His grandfather was a great falconer, so Jason grew up with raptors. He has turned falconry from a hobby into a career, and he clearly knows and loves his work. And Killary behaved quite well on our walk, flying from tree to arm, arm to tree as we toured the castle’s forested paths. I asked Jason if interest in falconry was on the rise given the popularity of Hedwig and the Harry Potter books. He bristled and declared that J.K. Rowling should be “torn limb from limb.” I was taken aback. Evidently, unscrupulous breeders have jumped on board, selling owls as household pets, and ill-informed families are keeping the birds in small birdcages. 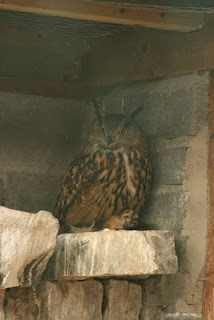 By contrast at the falconry school each owl has a clean and well-equipped room approximately 8 feet square and is flown daily. Jason recounted a recent experience where an owl, which had been confined to a birdcage, was brought into the school and had to be euthanized because it was so sick. He was clearly heartbroken about the experience, and as we headed back into the school’s confines, I was a bit sobered. Bidding adieu to Jason, our spirits lifted, however. Once again we walked past the birds’ clean and roomy quarters. A family group was just headed out – mom, dad, and three children all keyed into the gorgeous hawks their guides were sporting. The sky was blue. The sun was shining. It was a grand day to learn the age-old art of falconry. WOW! What an awesome experience! My nine-year-old son would be SOOO jealous! Rena, the cool thing is this is accessible for anyone. Really small children probably wouldn't be into it, but it would be perfect for a 9 year old. Honestly, it was one of the best days of my life! 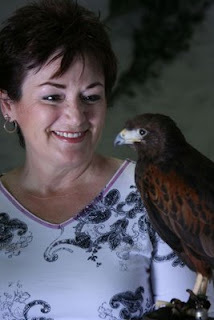 One of the last things I thought I would ever see is my Mother on a Hawk Walk. What majestic creatures these raptors are. It is an awesome sight to be in close proximity and behold the mighty power and sheer skill these true hunters possess. A natural, huh? Way to go Mom! Thanks to the writer for giving the opportunity for her to tag along. Just keep in mind that her son can travel better and smarter if you are ever in a pinch! Unless you need a flak jacket at the final destination. That looks like a wonderful experience, would love to do it myself some day.